13 July 2018 (Toronto, ON) - Polydor Records/Universal Music Canada, the country’s leading music company, is pleased to announce the release of MAMMA MIA! HERE WE GO AGAIN The Movie Soundtrack featuring an all-star cast bringing the timeless lyrics and melodies of ABBA to delight fans old and new alike. Listen to the official soundtrack HERE. 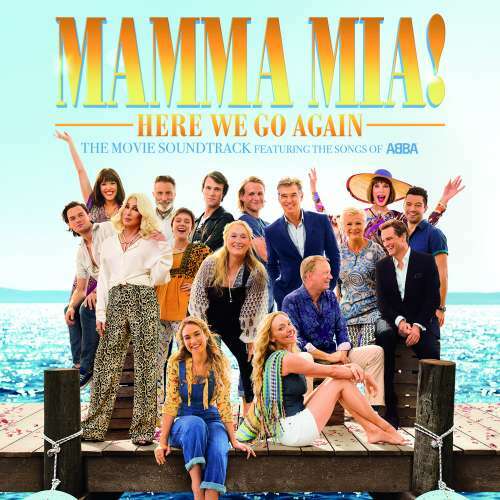 Available today, the soundtrack whets the appetite of eager audiences a week before the release of the highly-anticipated sequel to the smash-hit MAMMA MIA! The Movie. MAMMA MIA! HERE WE GO AGAIN will be released July 20 and will see Meryl Streep, Amanda Seyfried, Pierce Brosnan, Colin Firth, Christine Baranski, Stellan Skarsgård, Dominic Cooper and Julie Walters reprising their roles from MAMMA MIA! The Movie, with Lily James and Cher joining the cast for an all-new original musical based on the songs of ABBA. Andy Garcia, Jeremy Irvine, Hugh Skinner, Josh Dylan, Jessica Keenan Wynn and Alexa Davies complete the cast. Watch the trailer for MAMMA MIA! HERE WE GO AGAIN HERE. Original ABBA member Benny Andersson produced and arranged the soundtrack, which features a dazzling ensemble of cast members making their mark on eighteen ABBA classics including “Fernando” (sung by Cher and Andy Garcia), “When I Kissed The Teacher” (sung by Lily James, Jessica Keenan Wynn and Alexa Davies) and “Dancing Queen” (sung by Pierce Brosnan, Christine Baranski, Julie Walters, Colin Firth, Stellan Skarsgård, Dominic Cooper & Amanda Seyfried) to name a few. The full tracklisting and credits are below. MAMMA MIA! The Movie, released in 2008, also based on the songs of ABBA, is one of the highest-grossing live-action musicals of all time. Its companion soundtrack sold 1.5 million copies in the UK and achieved global sales of over 7.7 million. Almost a decade since its release, its popularity has not waned. There have been 406 million combined streams of MAMMA MIA! The Movie Soundtrack. ABBA are one of the most successful pop groups of all time. The Swedish quartet have sold over 385 million albums worldwide and their songs have been streamed over 2.8 billion times. The release of MAMMA MIA! The Movie prompted a surge in sales for ABBA, whose hit compilation ABBA Gold went back to No.1 in the albums charts some 16 years after its original release.